What community involvement have you had? How many school board meetings have you attended in the past 3 years? Over the past three years, as a member of the Board of Education, I have attended 29 School Board Meetings. During the three years prior to being elected I attended 29 board meetings as a member of the gallery. What are the challenges facing the school district? How would you address them? There are two major challenges that the trustees will face over the upcoming term. Over the past few years there has been a significant increase of new families moving to West Vancouver, and with that we have seen a surge in the number of students accessing our English Language Learning programs. To effectively help integrate these students into our school communities we will need to continue to ensure there is adequate ELL support in our schools. We will also need to continue to work with the SWIS (Settlement Workers in Schools) workers, the North Shore Multicultural Society and other settlement groups to help ensure these children, and their families are well supported. The Changing demographics in our community are also just that – a community issue. The School District will need to work together with the Mayor and Council and other community groups to find ways to engage and integrate these new families into our community. The second emergent issue concerns the two extended, and acrimonious periods of job action we have just faced. The next Board of Education will need to ensure that we advocate provincially to the Education Ministry, the BCTF, the BC School Trustees Association and the BC Public School Employers Association insisting they work together to assess what went wrong in the last round of bargaining. We need to ensure that steps are taken immediately to fix a broken bargaining system and we have five years to work collaboratively to find a solution so that we do not see further erosion to public education. An effective school board is made up of community leaders who understand and value public education. To be most effective a board must work together in a cohesive and collaborative manner to put student success above all other interests. The West Vancouver Board of Education has always been forward thinking, finding ways to create and enhance revenue streams. We were the first school district to consider international programming and have been a leader in establishing sports academies as ways to increase revenue. In ensuring that we provide the best educational experience possible for our students we have become reliant on fees from international students to supplement the funding we receive from the Provincial Government. While we currently have a thriving International Education Program we need to ensure that we have other funding sources to draw upon if circumstances change. Formulate a plan to carefully explore options of partnering with private companies; providing advertising opportunities or donations in kind, such computers for schools and playground equipment. Expand our current academy programs and look for new programming options that will attract students to our schools. Continue to work with countries that we have not traditionally looked to for international students. The more diversified our program is the less dependent we will be if economic or social circumstances change in certain countries, preventing students from choosing to study in West Vancouver. Work with the District of West Vancouver and other school districts to investigate opportunities for shared services such as accounting and facility maintenance. How many school board meetings have you attended in the past 3 years? How would you address them? Look for innovative financial solutions to these challenges and uncertainty issues. Increase or develop new sources of revenues. Manage costs more efficiently. taxes withdrawn from the community. Convince the Province of the economic impact and importance of quality education. An effective school board requires a clear delineation of responsibilities between policy issues and actual day-to-day operational management. No board should try to micro-manage the organization where it has qualified senior administrators who would become inefficient if a board tried to interfere. Having said that, Trustees must be willing to learn and understand the issues. This requires the ability to listen, have insight and respond appropriately to all stakeholders. It requires Individuals who are keen and eager to devote their time and energy. They must have good reporting skills and the ability to come to a consensus on board decisions. Apparently this is not yet a problem as recent 2014-15 enrolment statistics show an increase of 75 international students to date. However in the event that this problem arises in the future and replacement sources of revenue are required, I believe that the WV School District should undertake a more open and aggressive marketing campaign to compete with various private schools on the North Shore. This can entail all forms of advertising such as physical signs placed in strategic locations, printed advertising in newspapers and elsewhere as well as significant social media exposure. 1. What community involvement have you had? On my return from travelling abroad, I was surprised and alarmed that Canada appeared to be losing its identity and becoming American. I was chosen to be on an interim heritage committee to make recommendations to WV Council. I was totally committed to establishing heritage awareness, ran for Council and was elected in 1988. Also became the first council heritage liaison. Organized Heritage Week for Feb 1989 (and every year since). I have only missed about a dozen ccl mtgs since 1988. I’ve been on many, many council committees and on the boards of many local groups (ratepayers, streamkeepers, historical, heritage, etc.). In particular, was on Council’s Community Engagement Committee which established the very successful, and OPEN, Working Groups. Heritage Week in February 2015 is highlighting business nodes. 2. 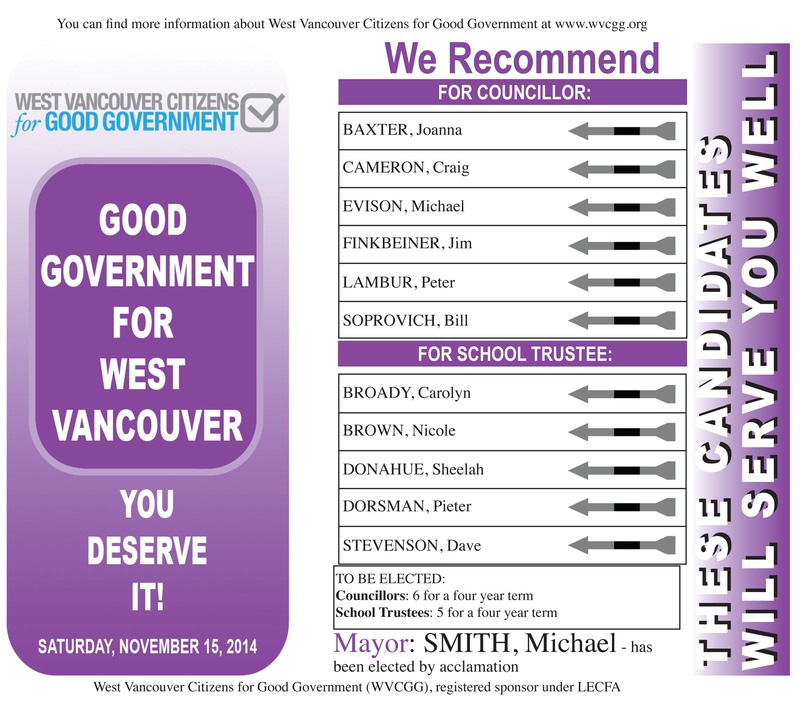 What are the top 3 issues facing West Van that need to be addressed in the next 4 years? What action would you take in these areas? 3 – Examination of the Budget including efficiencies (eg, outsourcing, cooperation with NV), staff’s higher salaries than the private sector, plus services (Important to note in surveys citizens often say they would rather pay higher taxes than lose or decrease services — no doubt residents have high expectations — user fees may be one solution). 3. Over the past few years, there has been much talk about rejuvenating Ambleside. What are your thoughts on that? There’ve been studies, let’s get a Working Group with staff, business representatives, ratepayers, and local residents to plan and implement! 5. WVD’s tax base is heavily tilted to residential property taxes. What would you do to broaden the tax base? Perhaps WV has an expenditure problem rather than a tax base problem. The community made a conscious decision not to have industry in WV. Yes, residents pay about 92% of the taxes and business 8%. Ambleside needs rejuvenation, so raising commercial taxes would not be an option. Again, have a working group with residents to put their heads together to see what can be done. It is yet again a question of what residents are willing to pay for what. 6. Tell us about your ideas to support commercial development in West Van. Have the commercial areas draw up a list (even a wish list) that could then be evaluated by residents/ratepayers, Council, and staff to see what could and should be acted on. Everyone will probably agree with addressing traffic and parking issues. Adjusting hours might help as well. Beautification and free events may attract people and liven things up a bit. A joyous fun place to be! Today’s successful governments are the ones with an interactive element between elected officials and their constituents. I believe in representative government, which provides meaningful communication between the community and city hall. A community can not operate without volunteers or engaged constituents. Having no volunteers means higher costs, fewer services and general disapproval. I know, from surveying our residents, that educational, law enforcement and neighborhood developmental concerns are at the top of the list of major issues. In order to address some of these issues, my community involvement has mostly been focused on teaching and coaching both the students and a health professional. I have been involved with coaching in both a professional and volunteer capacity. Obviously, for most of the residents of West Vancouver the key issue that still exists is appropriate development of their District. Firstly they are concerned about the scale and model of their neighborhood developments, and how these developments will affect their property and daily commute. An example of such is proposed development at 752 Marine Drive that will likely impact the traffic, particularly at the intersection of Taylor way and Marine Drive. I would make sure that there is substantial agreement between the municipality and Provincial counterparts, in order to identify and implement measures that would reduce the traffic backup. I would support and approve developmental projects that maintain the character of the West Vancouver neighborhood and meet the needs of our residents. In this regard I support the construction of multi-family housing, which can provide alternatives to the current housing. The second evident issue is related to the business or property taxes that can affect the revenue and spending of our residents. I would try to avoid an increase in business-related taxes. In the event of an increase in property tax, I would ensure that this increase is reasonable and limited to large and expensive properties. In general my presence will make the District operation more transparent, thus resulting in better decision making. I support the appointment of a municipal auditor to oversee the staff hiring, and facilitate new initiatives to make the District operations better staffed, more efficient and cost-effective. I would ensure that information concerning Bylaws and taxes are made available to the residents in a transparent and understandable format. I would also initiate an online site and round-tables that allow for debate concerning the current issues. The round-tables would present an opportunity for the different ethnic groups residing in West Vancouver to address their particular concerns and issues. Finally, I would make sure that the issues that are still facing West Vancouver such as British Pacific Properties, Park Royal development, Translink, and the Squamish Nation can be addressed as effectively and transparent as possible. West Vancouver has promised to build the Spirit Trail through West Vancouver to Horseshoe Bay. I would support this project and act as a facilitator for the completion of this project. Compared with the two North Vancouver municipalities, West Vancouver is lagging behind in the building of the Spirit Trail. As a council member in the next administration, I would support the initiative to start the building of an off-road Spirit Trail route between Ambleside and Dunderave, especially since we are aware that the foundation of funding for this trail has come from different Provincial and local sources. 4. Incumbents: What has been your accomplishment in the last 3 years? What do you hope to accomplish in the next 4 years? Broadening the tax base essentially means subjecting more gross revenue to taxation by eliminating or holding back tax expenditures such as deductions, exclusions, credits and exemptions. Such actions have great value beyond raising revenue. They would help the tax code adhere more closely to the principle of horizontal equity. Broadening the tax base does not have to be another way of saying ‘increasing taxes’. On the other hand, expanding the tax base is concerned with the creation of more assets on the tax rolls, in order to spread the cost of operations across more entities. This would result in more money being available to enhance the government-funded community, allowing for the development of many projects from a new hospital with in Vancouver to the expansion of roads. In order to expand the tax base, I suggest we support small businesses that create new jobs, which in turn will increase tax revenues. We need to build strategies in order to market the West Vancouver District to new residents, especially retirees, middle- to high-income families, and young professionals. We need to encourage the philosophy that, both shopping and conducting business locally, gives West Vancouver the resources it requires to maintain and improve its quality of life. As the tax base grows and broadens, the community of West Vancouver will enjoy the benefits of new tax money. 6. Tell us about your ideas to support commercial development in West Vancouver. West Vancouver, specifically Ambleside, requires commercial development in order to address the needs of a growing population. I would support development of business projects that maintain the character of our neighborhood in West Vancouver and meet the needs of its residents. I would take the lead in the key developmental processes. Demand for environmental products and technologies are expected to expand in the years ahead, and our local companies that can successfully compete in this capacity will benefit from this trend. West Vancouver will see a rise in the number of businesses producing green goods and technologies. I would study and strategically determine what we can do to attract green businesses to West Vancouver, and I would find the unique economic advantages of developing of these green technologies. Promoting green industries and environmental sustainability is an attractive path to pursue in the future. My civic involvement began almost 20 years ago when I ran for a Council seat the same year Bill Soprovich was first elected. As a newbie to West Van, I couldn’t claim long tenure that was then an unspoken mandatory requirement, so I wasn’t elected but my platform included ‘new’ ideas that no one else thought about at the time. My experience as a planner and architect told me that my new home community needed an Official Community Plan (among other things) and this idea was validated when a shiny new OCP emerged some years later. And as I live in Ambleside near Park Royal at the gateway to West Van, there have been many development issues affecting my neighbourhood that have attracted my attention over the years. As one of the leaders of the Coalition for a Health Community, I helped turn back the Park Royal ‘Big Box’ development. A subsequent proposal gave us ‘Main Street’ and the most popular urban space in our community. And there’s Evelyn Drive: working with Ray Spaxman’s team, I helped develop the area plan for this major development at Keith Road and Taylor Way to fit in with the surrounding residences (including mine). On the other side of the ledger, my efforts on behalf of my neighbourhood had no influence on the District-mandated artificial turf fields in Ambleside: a deal done without consulting neighbours (an omission that Mayor Goldsmith Jones personally apologized for). And then there is the Ambleside Revitalization project: in 2006, I helped develop the initial character sketches for a low-rise mixed use Ambleside Village since replaced by the outsized Grosvenor Marine Drive 1300 Block proposal opposed by a majority of area residents. More formally, I have sat as a member of the (advisory) Strategic Planning Working Group tasked with developing a new Vision & Mission Statement for West Vancouver. And less formally, I’ve volunteered with the Coho Festival and have supported the WV Master’s Mile and Coho Run for many years. It will be interesting to see if there is consensus among the candidates on the top issues, but for me the #1 over-arching issue is restoring community confidence in the consultation process. The current ‘system’ can be described as ‘top down’ and ‘one way’, discouraging dialogue between residents and the District. So many people have simply given up and see no point in expressing their opinion in the face of what they experience as an opaque and unresponsive municipal government. By way of example, at this week’s Council meeting (October 20t)h), an overflow crowd showed up to speak loudly against proposed changes to the building bylaw affecting single family homes and here, the issue of community consultation – more specifically the apparent lack thereof – was front and centre. Frustrated citizens have even taken it upon themselves to form their own lobby group – the West Van Housing Association – to get the attention of District staff and Council. This situation is symptomatic of a system that doesn’t work. It needs to be fixed. Issues #2 and #3? Well, I guess you would have to include fiscal sustainability among the top issues. While past Councils have measured their success in terms of zero or nominal tax increases (although this has not been the case where I live), West Van has the dubious distinction of spending more – much more – on municipal services than any other regional municipality: at $2,118 per capita (according to a recent Fraser Institute report) it’s more than double the figure for Surrey and more than 50% higher than the regional average. Allowing for the fact that our small municipality doesn’t benefit from the economies of scale enjoyed by Vancouver, Surrey, etc., the discrepancy is still arguably too large to easily explain away. How much we spend, where we spend it and value for money should be a standing agenda item at the Council table. But running neck and neck with fiscal prudence is the whole set of issues surrounding development in our community. At the Vancouver Real Estate Forum last year, the development industry highlighted the North Shore (including West Van) as a hotbed of activity. And much of the current and proposed development activity is next to or near existing single family neighbourhoods. And the problem is that many residents don’t have confidence in what is happening around them. There is a palpable sense of uncertainty that needs to be addressed. We need to update our Official Community Plan but more than that, we need to engage in continuous planning at the neighbourhood level. And somewhere between keep our fiscal house in order and worrying about the impact of new development on neighbourhood character, there’s the issue of the Public Safety Building: a legacy of Councils past that needs to be cleaned up early in the new term. There are of course many, many issues in addition to the above that are important. But it’s only because there’s not enough room in a limited top 3 list to include them all that they are not discussed here. You’re invited to visit my website at http://www.peterlambur.com and attend upcoming all-candidate meetings to learn more about my views. I live within a 5 minute walk of Marine Drive. There I find my bank, dentist, doctor, dry cleaner, tailor, shoe repair, hardware store, favourite ethnic grocery, bakery – well, I think you get it: Ambleside for me is alive and well. It offers what Park Royal doesn’t: a good mix of neighbourhood-serving retail and service businesses aligned with the needs of its customers and it continues to evolve with new retail and mixed use projects. But could it be better? Prettier?? Home to more high end shops??? A destination for visitors???? Yes to all of the above, but there is still much to do to develop the Town Centre strategy and a master plan as the foundation for marketing and developing a better Ambleside village. (And incidentally, a Town Centre master plan should be integrated with a master plan for the waterfront to enable synergies that will benefit each area). There have been missed opportunities on key sites to strengthen the village feel and public realm of Ambleside. Guidelines and development regulations (zoning and building bylaws) need work to ensure that future develop adds to Ambleside, not subtracts from it. And the very feature around which the Town Centre is structured – the major traffic arterial, Marine Drive – requires further study to balance vehicular traffic, pedestrian traffic and parking needs as the Town Centre grows. With 92% of municipal general tax revenue sourced from residential property taxes and no real commercial or industrial land base, West Van is in a unique (not in a good way) and potentially vulnerable position with limited opportunities to diversify its revenue sources. We can grow service and user fees as a partial offset, but all the low-hanging fruit in this area has already been picked. Ditto for developer user fees. Government transfers? Forget about it (i.e. don’t expect anything from Victoria). What we need here is to somehow grow the ‘other revenue’ category. We need some outside-the-box thinking and civic entrepreneurship that challenges the way we do things. I’d invite some of our accomplished business leaders to engage with Council on coming up with ideas big and small that might be leveragd to grow new revenue streams. The District should do everything it can to make it easy for businesses to operate in West Van. For bricks and mortar businesses, we need business friendly bylaws and enforcement and streamlined permitting processes. We should also promote an attractive environment for internet-based and home-based businesses, perhaps promoting live / work accommodation in select locations. Coached soccer and baseball for many years. Director Mt. Seymour Youth Centre–built facility to accommodate Mt. Seymour youth. Served on Board of several not for profit organizations including Simon Fraser Alumni Assn., Zajac Foundation and Board of directors of Cap. golf club. A. Financial–spending per capital in WV already at elevated levels. Compensation makes up very significant % of budget. Municipality faces increasing infrastructure replacement costs and potential significant underfunded pension obligations. No sacred cows in addressing future potential financial shortfall. Real compensation must come down over time; increased productivity from employees; change culture throughout organization; sacrifices must potentially be made by all stakeholders in WV and, if so, they must be fair, and be seen to be fair; outsource services where possible; share services with other municipalities; consider sale of underutilized surplus assets; just say no to most proposed new initiatives; expand commercial tax base. All this will take time and in the face of limited short term scope to effect change. This is a long term project and the leadership must come from the top. B. Traffic congestion-this problem is bad now and will only get worse going forward. Long term solution must involve third crossing to Vancouver/Burnaby and include rapid transit. We need to start process now including dialogue with other North Shore municipalities and provincial gov’t. We are just kidding ourselves if we don’t accept that a third crossing with rapid transit as part of the solution. Encourage more people to work closer to where they live. ie. more office and commercial in WV., more carriage houses, work with other municipalities to address common N.S. congestion issues. c. Critical priorities-develop set of critical and essential issues facing community and prioritize them. Then clearly communicate them to the residents of WV to get their input and agreement. Without support of community it will be difficult, if not impossible, for municipal officials to take appropriate action. We all, to varying degrees, live in an era of entitlement. Combination of A. and C. provide insurance against unforeseen “black swan” events in the future. Ambleside rejuvenation-given all the time this initiative has been analyzed and debated, surely it is time to move forward and start the redevelopment .If done properly this project could be a huge success for WV. Will attract commercial and business activity, keep more workers on North Shore, increase tax base. Broaden tax base-see 3 above. Also provide additional commercial and office space in WV, subject to demand. Provide additional community parking which should increase business activity in WV. Support commercial development-speed up approval process if project conforms to Official Community Plan. Support projects by providing expedited services required by municipality. Develop more community parking. Make WV business friendly.